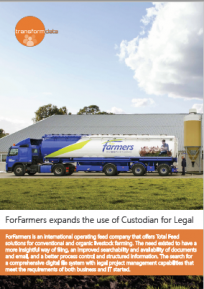 Custodian for Legal is a complete matter management solution based on SharePoint/Office 365. Use the powerful and familiar interface of Microsoft Outlook and other Office applications to ensure the highest level of user adoption. The flexible set-up provides an optimal fit for law firms, legal departments and legal service providers. Custodian for Legal is trusted by many law firms worldwide to integrate their matters into the familiar interface of Microsoft Outlook. 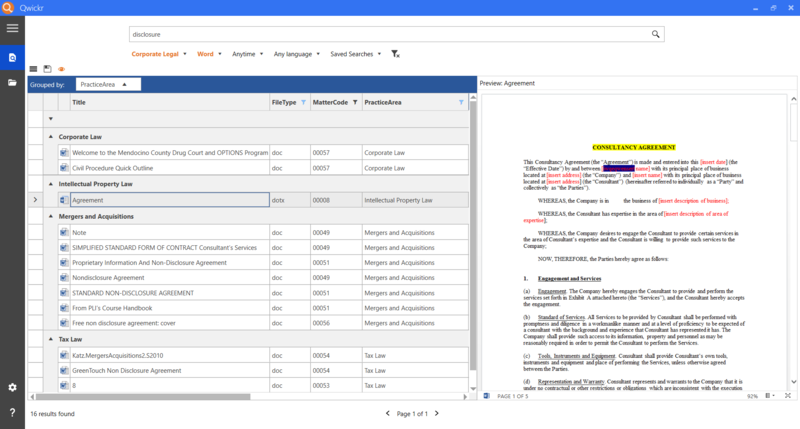 It integrates well with commonly used applications within law firms such as practice management, time tracking, document assembly and comparison software. 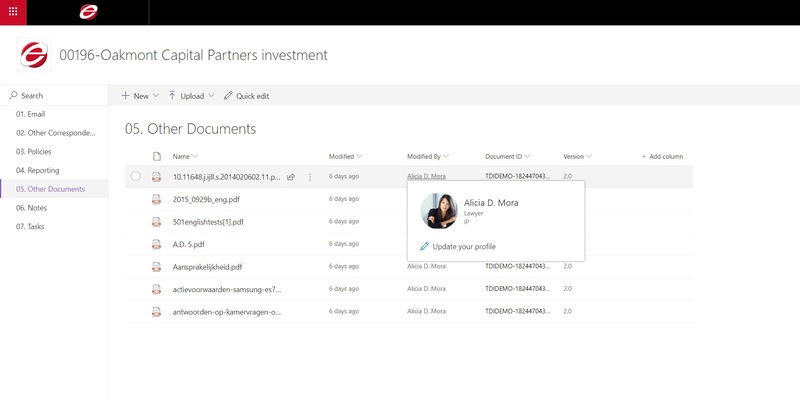 Manage internal filing structures, documents and emails within Outlook. Connect additional repositories such as deal rooms or knowledge archives to Outlook and benefit from functionalities like offline access, single search interface for all your repositories and simply move documents between various locations via drag-and-drop. 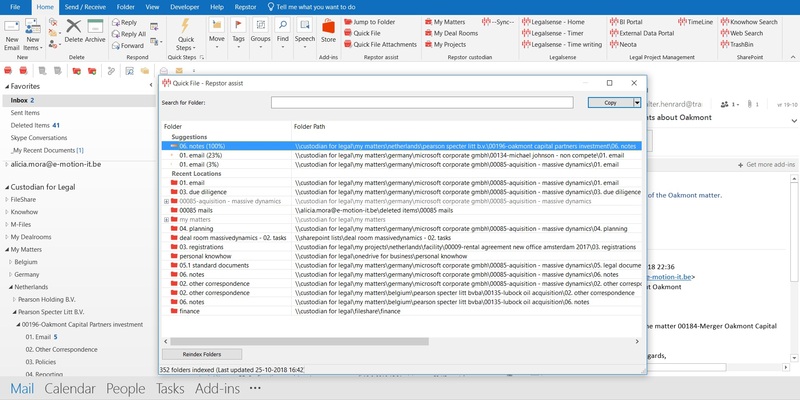 It is possible to connect to various sources similar to SharePoint, SharePoint Online (Office 365), HighQ, iManage Work, etc. Increase efficiency and improve compliance by using a software supported filing system. Analyze the data in the system that is filed by all users and match any incoming email communication and attachments to the available content. End-users receive suggested filing locations or filing can be completely automated to the proper locations. This solution goes beyond traditional matter management by using SharePoint/O365 functions, such as tasks, status reports, news feeds, timelines, instant messaging and OneNote. Firms can automate their way of case handling (tasks, milestones, document templates, etc.) for simple as well as complex matters into a matter template. 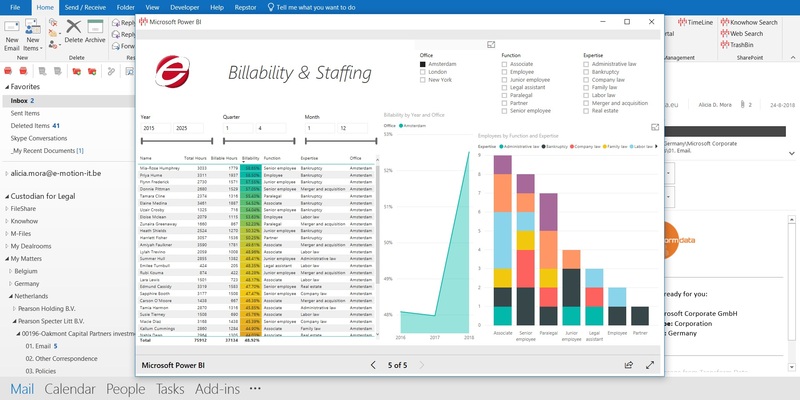 Professionals can easily keep track of their work from within Outlook, while managers can report on progress, billability, risks and other important KPI’s via intuitive BI dashboards. Benefit from the functionality of SharePoint Online that allows professionals to share specific and of course highly secured areas with external users or firms. Legal professionals use this typically as a deal room for transactions or to maximize the service for customers by providing a secure and friendly client portal. Client portals can be used to share documents, news, status updates and Q&A’s, or even provide access to self-service Expert systems that automate commonly used legal tasks such as the creation NDA’s or risk assessments. Create new documents based on corporate templates, merge with external data, apply corporate style and make sure best practices are used. The review and compare functions deliver great efficiency improvements and can be integrated with solutions from DocsCorp or SmashDocs. Automate the full process of sharing knowledge by employees and facilitate the submission, evaluation and publication of documents by knowledge managers. Users benefit from the powerful Search capabilities of SharePoint and Qwickr to find and use documents, articles and/or subject matter experts quickly and save personal searches for quick retrieval of custom data-sets. 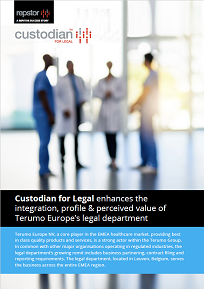 Custodian for Legal is trusted by many legal departments and enterprise organizations worldwide to integrate matters, projects and business requests into the familiar interface of Microsoft Outlook. It integrates well with commonly used applications within legal departments such as SharePoint and Office 365, SAP/ERP, template management, entity management and comparison software. Allow the legal department to implement a complete matter management solution on top of the (existing) SharePoint/O365 infrastructure without the need for any additional hardware or complex IT project. 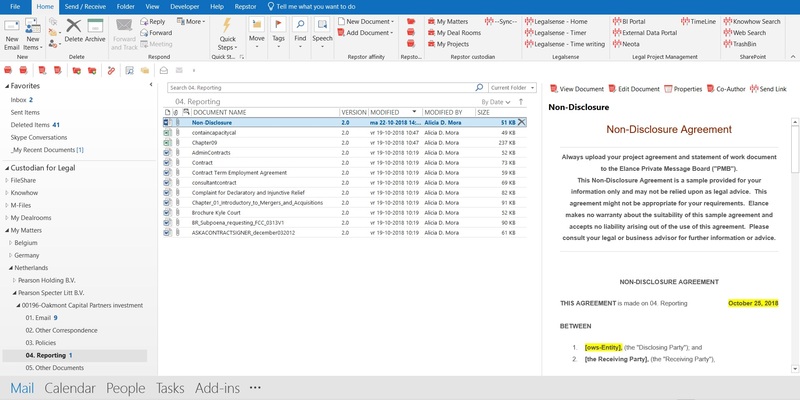 Professionals manage their matters, status updates, documents and emails within Outlook, while the general counsel always has the latest information available. Automate the way various departments communicate with the legal department, when needed with a pre-defined triage process. All required information is provided with any request and routed to the correct persons within the legal department. As a result, legal professionals can start working immediately on the case instead of having to collect additional information or having to forward incorrect requests to other people in the organization. Automating the full requests will also provide accurate data for reporting purposes such as response or resolution times. Large organizations often have to take care of various legal entities, which all have their own structure, corporate documents, reporting requirements, shareholders, etc. Allow legal departments to organize these entities in a secured and structured way that can be accommodated to the needs of the organization. This for example includes reminder functionalities for contract renewals and official filing moments. 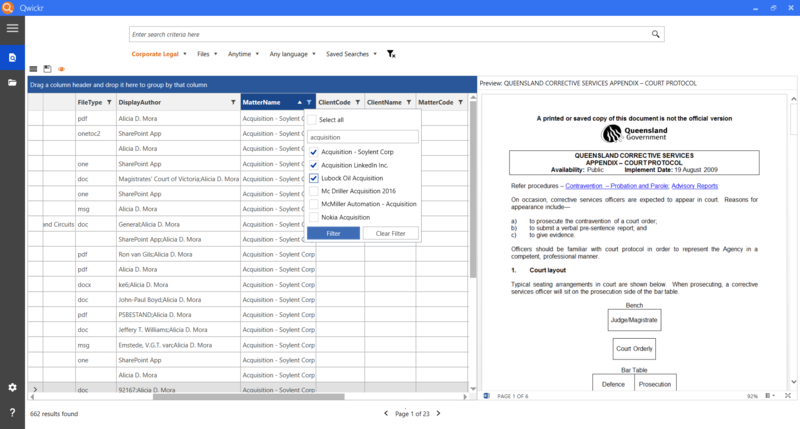 Simple ways to collect all executed documents in an organization include allowing legal users to upload signed contracts within Outlook or providing business users with a user-friendly form to submit any signed contracts. 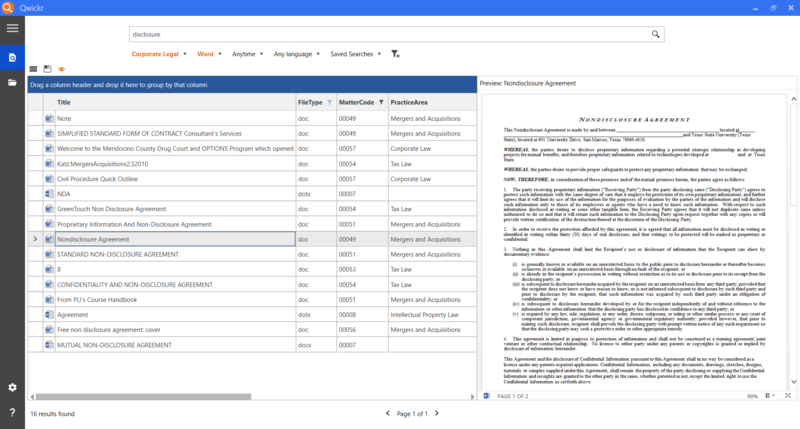 During the contract filing solutions, users are prompted to register important properties of a contract (effective date, renewal period, change of ownership clause, etc. ), while these properties can be used for detailed reporting and notifications later. Specific properties can be captured during the creation of matters or during the saving process of documents. 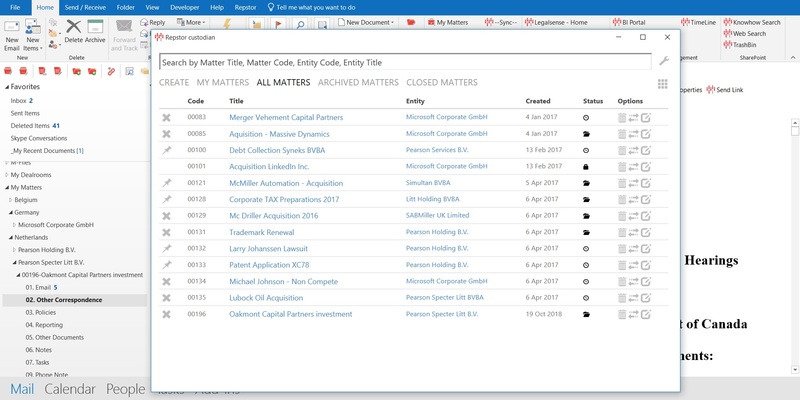 To quickly register a status update on a case within Outlook, a data set is provided to create an advanced BI dashboard that is typically used for claim reporting, etc. Users also benefit from the powerful Search capabilities of SharePoint and Qwickr to find and use documents, articles and/or subject matter experts quickly and save personal searches for quick retrieval of custom data sets. Allow departments to structure important knowledge documents and corporate document templates in a way that they are easily accessible for the entire department or other departments. By centralizing the template management, it is possible to optimize the compliance and ensure the latest versions of the corporate templates are available. 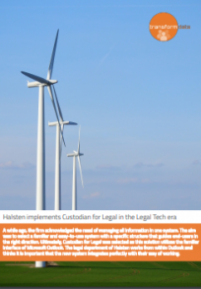 Custodian for Legal is trusted by many legal service providers and enterprise organizations worldwide to integrate matters, projects or specific transactions into the familiar interface of Microsoft Outlook. It integrates well with commonly used applications within legal departments and law firms and allows multiple organizations to easily collaborate in a matter, project or transaction with maximum security. Benefit from the sharing capabilities from SharePoint Online and provide a custom landing page for customers where they can access documents, knowledge and other information. This allows legal service providers to create a custom client page for customers, which can be used to share documents including version control and automatic notifications, news, status updates and Q&A’s. Also, access to self-service Expert systems is provided that automate commonly used legal tasks such as the creation NDA’s or risk assessments. Users benefit from the powerful search capabilities of SharePoint and Qwickr to find and use documents, articles and/or subject matter experts quickly and save personal searches for quick retrieval of custom data sets. Provide clients with a user-friendly form to submit any signed contract and allow service providers to easily collect all executed documents from an organization and move them into a secure contract vault. During the contract filing process, the important properties of a contract are registered, such as the effective date, etc. These properties are used to create advanced dashboards, overviews and reminders later. Benefit from the sharing capabilities from SharePoint Online and allow professionals to share specific and highly secured areas with external users or firms. Legal professionals typically use this as deal room for transactions that require high volume and secure document exchange with one or multiple external organizations. Easily push news updates, updated documents or instructions to clients or within the organization. Benefit from the user-friendly layout of SharePoint to create blogs and advanced pages with simple wizards. 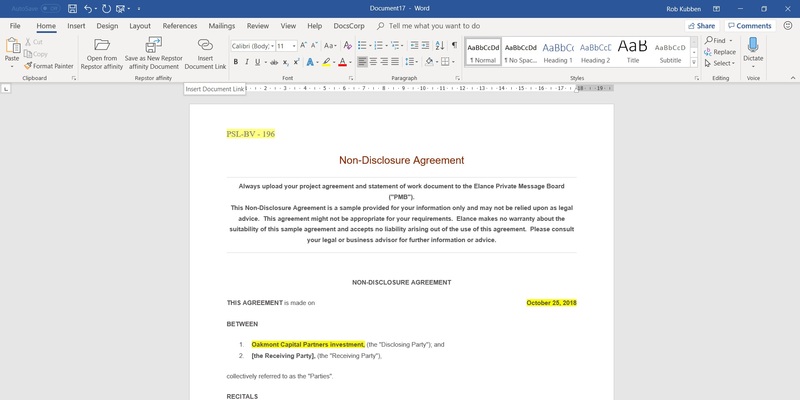 Use the document sharing functionality to build a deal room for a specific transaction or project. Go beyond traditional document or email management by using SharePoint/O365 functions such as tasks, status reports, news feeds, timelines, instant messaging and OneNote. Organizations can embed their way of working (tasks, milestones, document templates, etc.) for simple as well as complex matters into a matter template. 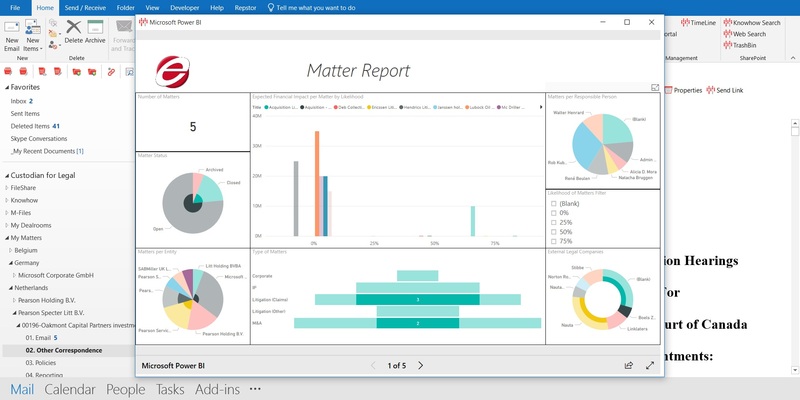 Professionals can easily keep track of their work within Outlook, while managers can report on progress, billability, risks and other important KPI’s via intuitive BI dashboards. Would you like to see more? Contact us for a full product demonstration.